OK, Where Are This Girl's Legs? Another day, and another optical illusion is confusing the hell out of the good people of the internet. 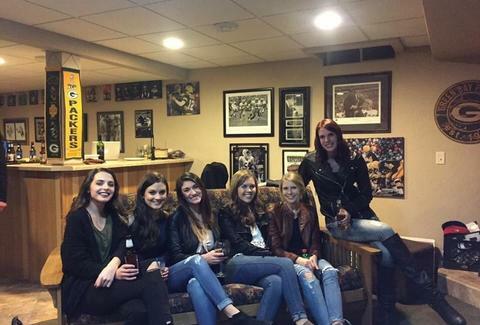 You see, there’s something very wrong with this picture of six young women all enjoying a tasty beverage on the couch, aside from the gratuitous Green Bay Packers worship. Presumably, one of these ladies is missing a pair of legs, because no matter how long you stare at this photo, there are only five pairs of legs extending from that couch. Six girls. Ten legs. And now an army of conspiracy theorists demanding answers. What in the gentle name of the holiday spirit is happening here? The girl in the middle of the photo appears to be floating, or something. It’s weird. Because people are wont to debating these things with strangers online, the illusion is being dissected on a Reddit thread, which is fast gaining the traction it deserves. 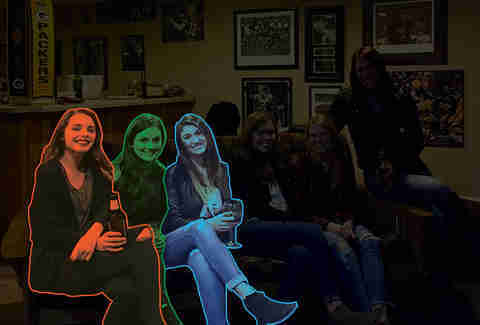 Unfortunately, some genius had to go and ruin the fun, pointing out that both girls on the far left are each wearing black pants, making all four of their legs kind of blend together in an amorphous blur. Whatever. You can choose to follow the rationale here, or you can just stare blankly at this marvel of the human mind and begin to theorize. If you choose the latter, Bill Murray and Tom Hanks will probably thank you. If not, put on this dress and stay tuned until the next optical illusion comes along.